Ballpark organists are an endangered species in professional baseball, right up there with players who hit without batting gloves and games that take under two and a half hours to complete. But at Rochester's Frontier Field, home of the Triple-A Red Wings, the mellifluous tones of the sport's most iconic instrument are still heard on a nightly basis. Fred Costello is the reason why. 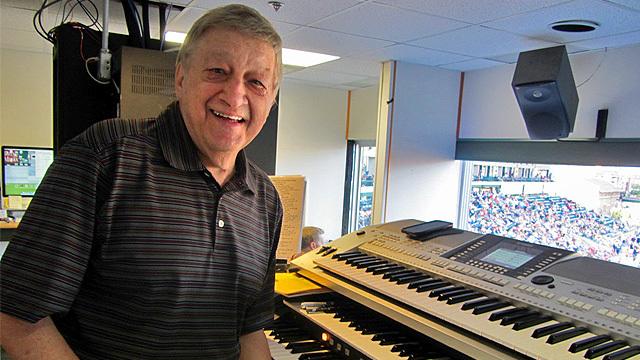 Costello, a New York native, has played the organ at Red Wings games for each of the past 38 seasons. But, like so many things in life, it wasn't necessarily something he had ever planned on doing. "I'm from Syracuse, but lived in Los Angeles for five years," said Costello, speaking during a break in the action during a Red Wings game on Aug. 23. "I was with a jazz group, playing in Vegas, L.A., and we traveled a lot. I played in 43 states in 11 years." But after his wife, Cathie, became pregnant with the couple's first child, the Costellos decided to move back to her hometown of Rochester. "We said, 'Let's go back to Rochester, have the baby and move back west," he said. "[Back in Rochester] I had this nightclub routine, the hottest group in town, playing six nights a week. We were bringing in guest stars like Lew Soloff from Blood, Sweat and Tears. I still wanted to go back to L.A., but by this point we've got a couple of kids." During this period of prolonged indecision, Costello happened to notice that Don Labbruzzo, an acquaintance from his days in Syracuse, had just been hired as the Red Wings general manager. "I called Don and said, 'What would you think about having music at the ballpark?' recalled Costello. "He said, 'That'd be great!' He signed me up in '77, and I'm still here. I never got back to L.A, except as a visitor. "When I took the gig here, I thought I would play the same things that I play in the clubs," he said. "You can't stretch out, but I'd play a little contemporary, a little jazz, a little bit of everything. And that's what I've done." Costello spent 20 seasons manning the Hammond B3 at the Red Wings' former home of Silver Stadium, transitioning with the team to their current Frontier Field abode in 1996. There he can be found on a raised perch in the press box area, in regular communication with control room employees handling the walk-up songs and other forms of pre-recorded entertainment. "We go back and forth [between live and recorded music], and then between innings I'll play a different song. I mix it up, contemporary songs, a standard tune and then a Latin tune," said Costello, who also spent 32 seasons playing the organ for the Rochester Amerks of the American Hockey League. "I try to stay up on the Top 40, but the hardest part is getting a tune that is conducive to one person playing it by themselves, without sounding bad or corny. Santana songs are great for that. "Of course, now all the batters have a walk-up song," he continued. "You've got to have that walk-up song. Can you imagine what Mickey Mantle, Ted Williams, what those guys would have had if they'd had a walk-up song?" But while Costello can't provide the walk-up songs, he can provide plenty of spontaneous humor. If the opposing team's manager comes out to argue with an umpire, then Costello might switch on his keyboard's violin sound effect and bang out a mournful, piteous dirge. And should the visiting pitching coach march to the mound for a conference, the sound of his footsteps might be mimicked over the PA via Costello's percussive pounding. "Some of the guys, once they get back to the dugout, they'll look up at me," he said. "That shows they have a little bit of a sense of humor." A sense of humor is advised when dealing with Costello's good-natured jabs, because who would want to run afoul of a Rochester institution? In addition to his 38 seasons with the Red Wings, Costello owns and operates a recording studio in downtown Rochester. His wife has worked as the Red Wings' nighttime receptionist for nearly three decades, and his son, Terry, spent some two decades as the team's visiting clubhouse manager. Because of these deep roots, Costello regretfully turned down the holy grail of baseball organist jobs: replacing the legendary Eddie Layton at Yankee Stadium. "[I auditioned] during a snowstorm in January . I went to the Yankees press box and [general manager] Brian Cashman and Layton are both there," said Costello. "I played four songs, and they called me four weeks later and offered me good money to play in New York. The problem is, I've got a big music studio here and I love this job, so I didn't want to relocate. So we went back and forth, and I eventually said, 'What if I paid my way down for each homestand and you take care of me for the other stuff… We went back and forth for two weeks and finally I just couldn't do it and they ended up getting someone locally. "And the topper of the story is that I got a call from the Mets two weeks later," he continued. "They had seen my DVD from the Yankees game, but I said, 'Before we go any farther, here was my problem with the Yankees.' And of course the Mets had less money.… But it felt good to be asked anyway." Costello remains a Frontier Field fixture, then, entertaining Red Wings fans via the sweet sounds of the organ. "I would hope teams go back to [the organ]," he said. "It's nice because with live music you've got spontaneity, and as a full-time musician all of my life I'm always an advocate of live music. It's something for all ages. What can you do but hope for the best?"